Along with the LS, the ES helped to launch the Lexus brand in the United States. Since then, it has often served as the brand’s best-selling car, if not their best-selling vehicle overall. The ES offered the luxurious feel of the LS in a smaller, more affordable package, making the mid-sized sedan very popular. However, as the luxury sedan market has evolved over the past decade or so, there has been a shift from simply being luxurious to combining luxury with sportiness. As a result, Lexus rolled out the F Sport models that introduced a heavy dose of performance-minded design to their vehicles. But as of the 2018 model year, the ES stood alone as the only sedan without an F Sport package. The F Sport models for the IS, GS, and LS have all offered the perfect mix of performance and luxury. 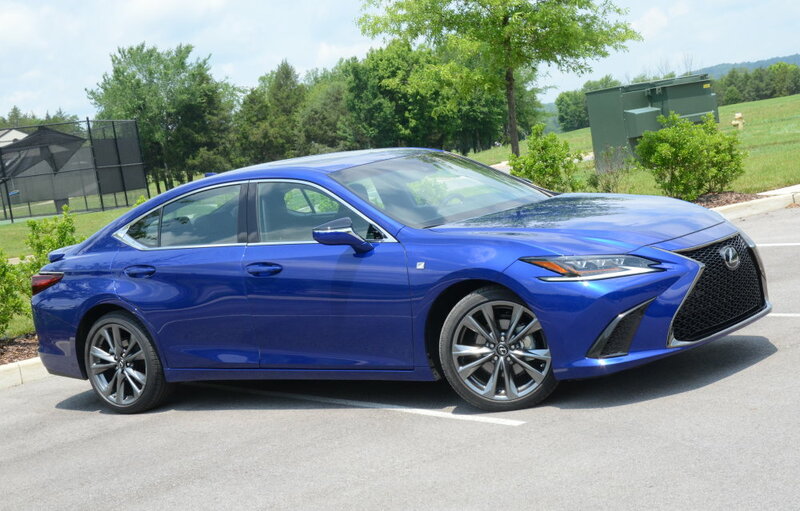 So with the 2019 Lexus ES being the first of its kind to get the F Sport package, I had big expectations for the first performance-oriented ES 350. After spending a day cruising around Tennessee, I was not disappointed. In every Lexus F Sport model, there is an array of aesthetic changes inside and out that allow these luxury-performance sedans to stand out from the non-F Sport crowd. In the case of the new ES 350 F Sport, the flowing, vertical grille bars are replaced with a gloss black mesh that is comprised of many tiny interlocking ‘L’s. The chrome strip tracing the sides and bottom of the signature spindle grille on the F Sport is a dark chrome finish, rather than the bright chrome on the other models. This is copied at other points around the exterior; where the non-F Sport has bright trim, the performance model goes with a darker look. 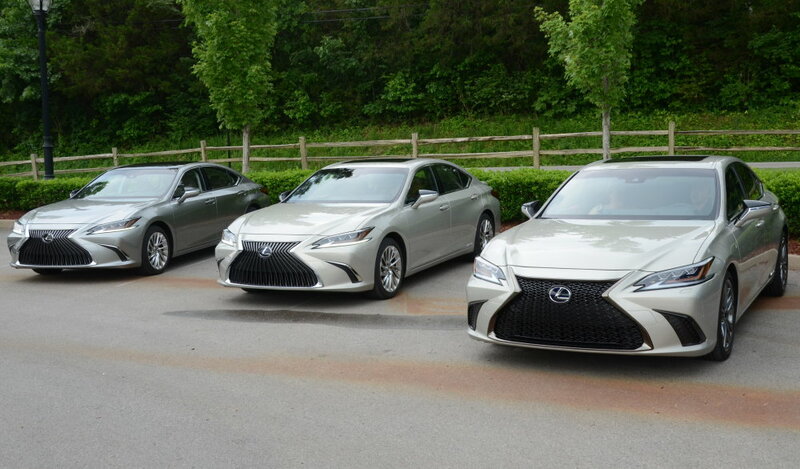 In the image below, the F Sport is on the right, the hybrid is in the middle and the base car is on the left. In addition to the unique grille and dark chrome trim, the 2019 ES 350 F Sport has larger vents at the outer corners of the front fascia, along with larger rectangular exhaust tips integrated into the black-trimmed lower rear fascia. There is also a low-profile spoiler out back that improves aerodynamics while also adding a bit of a sporting feel to the mid-sized sedan. 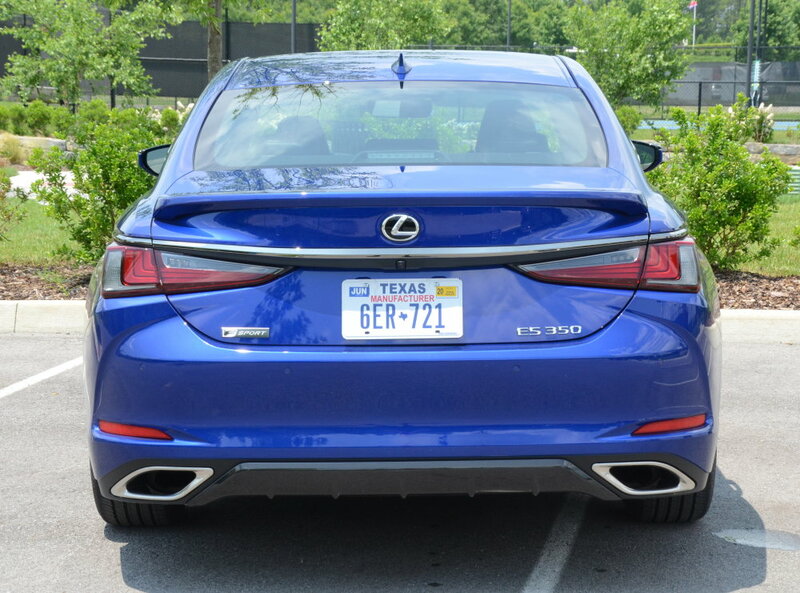 Of course, there is also the familiar F Sport badge below the driver’s side taillight, and the diminutive square F Sport badge on the front fenders, but like the other Lexus performance models, the ES 350 takes a subtle approach to announcing the performance trim level. Like the rest of the 2019 ES lineup, the ES 350 F Sport is available with the three-unit adaptive headlight system, and the signature LED lighting under each of the angular headlight lenses provides an aggressive touch on all models. The designers finished off this performance-minded exterior design with a set of 19-inch, split-spoke wheels finished in black chrome and wrapped in Michelin performance rubber. Really, if nothing else about the F Sport changed from the base ES 350, the combination of this new headlight design with the optional adaptive LED lighting, the LED signature headlight trim, and the F Sport-specific grille and fascia treatment make this new ES considerably more appealing to anyone shopping for a luxury sedan with an edgier, aggressive exterior design. The 2019 ES 350 F Sport is just sporty enough to appeal to the performance-minded buyer, but the styling hasn’t been cranked up to the point where it looks more like a tuner car than a luxury-performance sedan. Frankly, I think that the exterior design of this new Lexus ES F Sport is just about perfect.